Noria Mabasa was born Muelelwa Noria Luvhimbi on 10 May 1938. She was born at at Shigalo village, Limpopo. In 1955 she married Jim Mabasa who was from Ha-Mutsha village. She separated from Jim Mabasa in 1965 after she fell ill with a mysterious illness. Jim Mabasa was impatient with her and ordered her to leave his home. She went back to Shigalo village. The creation of bantustans in the 1960s led to Noria and her family being forcibly removed from Shigalo village in 1968. This was due to the fact that Shigalo village had been incorporated into the newly created bantustan of Gazankulu which was a reserve for Tsonga-Shangaans, and Noria and her family were not allowed to stay there since they were Venda-speaking. She was relocated to Tshino village, Ha-Nesengani, in the Vuwani area. Noria’s health continued to deteriorate while at Tshino and there were fears that she would die. She had a recurring dream in which an unknown old woman was showing her how to make clay sculptures. She did not know how to interpret the dream and she did not know what it meant. She reached a point where she lost her speech. One night, in 1974, her father who died in 1950 appeared to her in her dreams. He asked her why she was ignoring the old woman in her recurring dreams who was showing her how to make money. He picked up a reed and beat her on her right shoulder. She trembled with fear. But the trembling continued even after she had woken up. She continued to tremble for days. Her father appeared to her in her dreams once more some few days later and ordered her to reconcile with her half-sister, Mutheiwana. She got up at 05h00 and headed to Mutheiwana’s home immediately. She was, however, wondering how she would communicate with Mutheiwana since she had lost the ability to speak. But as soon as she reached Mutheiwana’s home she was able to utter the words ‘Aa’ (hello). These were the first words she had been able to utter in more than six months. Noria told Mutheiwana about her father’s appearance in her dreams and that she had been ordered to reconcile with her. Mutheiwana went to fetch her sister Mutshinya. The three of them headed to Sampson, Mutheiwana and Mutshinya’s brother (and Noria’s half-brother). They then performed muphaso, an ancestral offering done with water and snuff. Noria’s trembling stopped immediately, and her mysterious illness, which had haunted her for nine years, disappeared. For the first time in almost a decade Noria was on cloud nine. Vho-Muelelwa Noria Mabasa: A Living Legend. Noria started making clay pots and clay sculptures of domba figures. She did not want people to know that she was making clay pots and sculptures because she thought it was not something to be proud of. She would, therefore, work indoors making clay pots and sculptures. But she would hide them in her house because she did not want people to know that she was making clay pots and sculptures. She was, however, later forced to start selling her pots and sculptures since she no longer had storage space. She sent her daughter to Tshilidzini hospital, Thohoyandou, to sell some of her products. Her daughter brought back R20, which was a lot of money in 1974. Noria discovered the identity of the old woman in her dreams after she went to a funeral in Vuwani. She related her story to some old women, and after giving the description of the woman in her dreams, one of the old women told her that the old woman in question was Tshidzeuli. 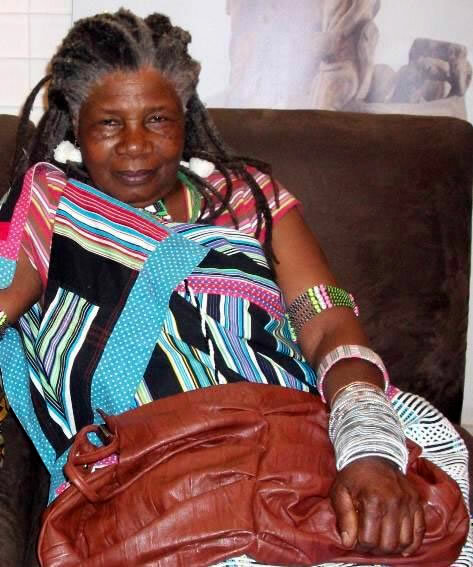 She was told that Tshidzeuli had died many years before and that she was a friend of Noria’s grandmother, Tshitaudzi. Noria ventured into woodcarving in 1976. This was after she dreamt of a log that was stuck under the Luvuvhu river bridge, less than a kilometre from her home. She woke up and went to the bridge, and found the log she saw in her dreams. She then went to borrow an axe from Mr Ramabulana (commonly known as Vhavenda Vho-Ramabulana). She used the axe to carve her very first wood sculpture. 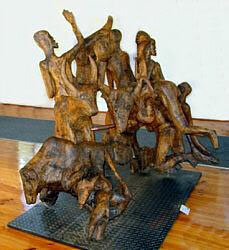 In 1983 Noria teamed up with another Venda wood sculptor, Mr Nelson Mukhuba. Her skill made her the first black woman, and the only Venda woman in South Africa, to become a famous wood carver. She also began to create works which followed more contemporary themes. In 1985 Noria joined Ditike Art and Craft Centre, in Thohoyandou, a project of the Venda Development Corporation which recognised her ability, and began promoting her work. Although in indigenous Southern African cultural traditions women are generally considered subservient to men, in the Tshivenda culture women do not necessarily share this inferiority. “Within her own courtyard (muta), a woman is in charge. Women are allowed to own property, which is usually given to them by their fathers or inherited when there is no male heir. I am the head of my house-hold. I own my property and I am respected by my family and community”, says Noria. Noria’s work has taken her to countries such Britain, France, Netherlands, Germany, Norway, Sweden, etc, where her sculptures have been displayed and sold. Her sculptures adorn entrances, and foyers of many public areas in South Africa, including the Sandton Convention Centre, the National Arts Museum in Tshwane, and the Union Buildings. Today Noria runs an art and craft academy from her home at Tshino, Ha-Nesengani. The academy is called Vhutsila a vhu Tibiwi (art is not concealed). She has so far trained more than 50 youngsters in clay and wood sculpting. Vho-Muelelwa Noria Mabasa is a true heroine and a living legend.